Sunway City Berhad (SunCity) launched Sunway Aspera, a development that comprises 76 units of 2-storey and 9 units of 3-storey terrace homes in a relaxing seaside environment in Sungai Batu, Penang, on May 6. These terrace homes are uniquely designed where life's best is experienced to its fullest in both an indoor and outdoor environment. Ideally nestled near the sea, these modern homes boast a built-up that is fitted with separate wet and dry kitchens, a spacious master bedroom with a dedicated walk-in wardrobe and a private bay window. The estimated gross development value is RM47 million and pricing of the units starts from RM495,000 onwards. The lot sizes are 20’ x 60’ and 20’ x 65’ for 2-storey terrace houses and 22’ x 70’ for 3-storey terrace houses. 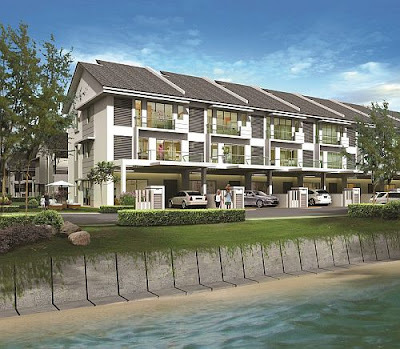 Sunway Aspera follows the success of the Group’s well-received development, Sunway Bukit Gambier which comprises of 3-storey courtyard homes, 3-storey semi-detached homes and 3-storey bungalows in Bukit Gelugor, Penang. Apart from Sunway Aspera, SunCity has other projects in Penang, including Sunway Merica and Sunway Prima. PLENITUDE Bayu Sdn Bhd plans to acquire 27 parcels of freehold land for RM45 million in Penang's North East district to develop another residential project. In a note to Bursa Malaysia today, the subsidiary of Plenitude Bhd said it would acquire the land from Geotrade Sdn Bhd-Eden Ferringhi Resort. The acquisition is strategic as it would allow the group to tap on the success of the Bayu Ferringhi project in Batu Ferringhi, it said. "The development of residential properties to be undertaken on the said land will not only provide Plenitude with a new sustainable source of income but it will also enhance its position in the property development sector," it said. Plenitude Bayu, formerly known as Golden Valley Network Sdn Bhd has proposed to develop medium high-end, semi-detached houses and condominiums, with the target market being first and second home buyers, resort home buyers, expatriate community and Malaysia My Second Home applicants. It said the purchase price of RM45 million for the parcels of land was derived after taking into account the development potential of the land arising from the surrounding matured housing and infrastructure. It also took into account the established medium to high end, semi-detached and bungalow houses next to the land and the close proximity to Batu Ferringhi beach and town area. The proposed acquisition is expected to be completed in the first half of the financial year ending June 30, 2011 and contribute positively to the group''s earnings in future years. Allstones Group Asia plans to revive a few abandoned housing and commercial projects in Malaysia, Thailand and Singapore, founder and chairman K.H. Sim said. It has in the past revived three projects which are now called Taragon Yap Kwan Seng, Taragon Puteri Cheras and Taragon Puteri KL. Sim said Allstones is focusing on Malaysia currently and is looking at two projects, but he declined to name them. "We expect to complete the purchase of one project in the third quarter and start working on it by December. We hope to strike the deal for the second project in the fourth quarter and re-launch it early next year," he said. The value of the two projects, including the three that Allstones has revived, is close to RM1 billion. "It is challenging as sometimes banks don't want to take a haircut or shareholders don't want to sell. But it is a great satisfaction when it happens," he said. Allstones has also been invited to do projects in Thailand and Singapore. In Kuala Lumpur, Allstones is in talks to buy land for a residential development and hopes to seal the deal by year-end. Sim said the outlook for residential properties in the Klang Valley is currently positive. "If you are going to be an investor in properties, always look for projects that offer you value for money and go in early. And don't link yourselves to branded developers. Look for churns so you could have good returns," Sim said. ALLSTONES Group Asia will set up a RM750 million property fund here by early next year to invest in distressed assets in Southeast Asia, founder and chairman K.H. Sim said. The property development and investment group is also mulling to launch a real estate investment fund (REIT) in Malaysia or Singapore. "I prefer a REIT instead of getting the company listed as we rather take the development risk ourselves and provide steady income to investors. We are building our investment portfolio," Sim said. "In my view, REIT is quite an interesting valuation as it allows developers to monetise the assets. REIT is also a secured investment against buildings and assets," he said in an interview with Business Times in Kuala Lumpur recently. On the fund, Sim said he is talking to a Singaporean and an Australian group as well as a local private investor to invest and make up about 10 per cent of the fund. The rest will be held by insurance and pension funds. SUNWAY Holdings Bhd plans to develop an integrated city in XuanCheng, 260 km east of Shanghai. In a filing to Bursa Malaysia today, Sunway said the city would consist of an international-standard entertainment park, exhibition centre, hotels, shopping malls, offices and residential units. It said the land would be acquired from XuanCheng Municipal Government. "Sunway will be the master developer and will undertake a feasibility and market study on the proposed development. "The project is expected to contribute positively to the future earnings of the company," it said. PETALING JAYA: The International Financial Reporting Interpretations Committee on real estate development (IFRIC 15), which will become applicable for the accounting period commencing July 1, is likely to affect investor sentiment in property stocks, analysts said. Under the new ruling issued by the Malaysian Accounting Standards Board, property developers are to recognise revenue based on the completion method instead of the percentage-of-completion method in current practice. ECM Libra Capital Sdn Bhd research head Bernard Ching said the new ruling could deter shareholders that based their investments on a company’s earnings. “Investors that are not so sophisticated and less informed about the company’s operations will be deterred when they notice that the company’s earnings aren’t so consistent,” he told StarBiz. “Fundamentally, this new ruling does not change anything as there is no cashflow impact. The only difference is recognition of the company’s accounting profits,” said Ching. He said developers exposed to strata-high-end projects, which often take three years (as opposed to landed residential projects that take only two years) to complete would be most affected. Ching said a way around this was for developers to become more transparent with their investors. “It’s a silly rule. What is wrong with the way earnings are reported that requires it to be amended? Whoever came up with the ruling I feel has zilch industry experience. He, however, added that the reaction, if any, would be temporary. Affin Investment Bank, in a recent research report, said earnings for developers were expected to be lumpy and volatile, and might appear negative on the surface. “Analysis on profit and loss, such as profit margins, (including quarterly earnings) will be tough, as it will be purely based on the guidance from developers on their job completion schedule. Earnings from newly launched properties can only be seen two to three years after the properties are completed. “As such, valuations based on earnings are not quite valid to reflect future earnings prospects. Instead, valuations based on RNAV (revised net asset value) will be widely used to assess the relative attractiveness of different property stocks,” it said. The research house does not anticipate developers to continuously launch projects just to have a healthy balance sheet. “The property sector is known to be cyclical in nature and pretty much depends on economic conditions. Despite the adoption of IFRIC 15, we believe developers will still launch new properties at the best and right time that they reckon. It also said developers with fewer launches and smaller landbanks could be badly affected. SAPURA Auto Sdn Bhd is proposing the disposal of a piece of land in Kuala Lumpur, which presently houses an automobile showroom, to Sime Darby Motor Division Sdn Bhd for RM49.054 million, cash. Sapura Auto, a subsidiary of Sapura Resources Bhd, said the proposed disposal could result in a net gain of RM22.98 million and address the continued losses arising from the group's automotive business. "The proposed disposal enables the company to unlock the value of its assets and raise immediate funds which may be channelled towards the acquisition of new businesses, expansion of existing businesses and or pare down the group's borrowings," it said in a note to Bursa Malaysia today. Sapura Auto bought the land and the building for RM26.13 million in November 2006. However, the land and building has been collectively appraised by Messrs Henry Butcher for RM47 million in comparison with existing properties transacted around the vicinity. DUBAI: Dubai house prices climbed 2 per cent year-on-year in the first quarter, their first annual rise since the 2008 financial downturn, but oversupply would pressure prices going forward, Colliers International said yesterday. Prices in the Gulf Arab emirate, home to the world's tallest building, rose 4 per cent in the first quarter from the previous quarter. That marked the third consecutive quarterly rise, Colliers said, in a sign that the property market is stabilising. House prices in Dubai have slumped some 55 per cent since their peaks in the third quarter of 2008. "There will be significant oversupply in the market by the end of the year so it is anticipated the index will experience fluctuations going forward," said Ian Albert, the firm's regional director, referring to its house price index. "What will be important to watch is how much of the supply matches the end-user demand for community-oriented developments," he added. Colliers International estimates that 41,000 homes will enter the market by the end of this year, mostly in the low to mid-income segments. Colliers International said that while demand is not expected to match the supply growth. Colliers remained unclear as to whether future supply would have a negative impact on established projects, which are typically more resilient to market conditions. Albert added that while banks are starting to lend again, it was unlikely that all of the supply would meet the new and much stricter lending criteria. Apartment prices in Dubai rose 6 per cent in the first quarter from the previous quarter, villa prices climbed 2 per cent while townhouse prices fell 4 per cent, the index showed. House prices and rents are set to fall 10 per cent more in 2010 and not recover until 2012, a Reuters poll showed in April.